Do you want to make custom signs for your home decor? We have just what you need - custom stencils - made exactly in the size and with the quote you want. Our SINGLE USE vinyl stencils are so easy to use! Simply apply it to your surface, remove the top layer of transfer tape, paint and let the paint dry, then remove the stencil. Voila! Our photos show just some of the amazing things you can do with our stencils. PLEASE NOTE! These are SINGLE USE stencils as they have an adhesive backing. They are great for clean edges unlike typical reusable stencils. They also do not have breaks in the letters so you won't need to fill in all those spots! 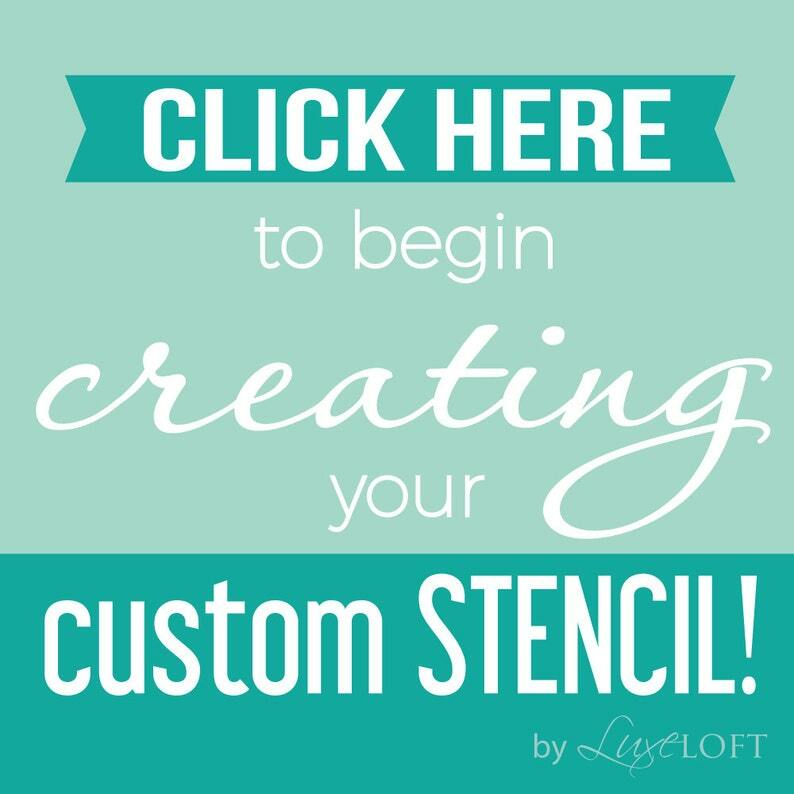 If you plan to paint something more than once, multiple stencils must be purchased. We do offer discounts depending on the amount. Since these do have an adhesive backing and need to be installed similar to a decal, we still recommend these be used on a decently smooth and clean surface. Most wood signs are perfectly fine for this and other slightly rough surfaces as long as they do not have a lot of dirt or debris on them. Be sure to clean them well before installing. 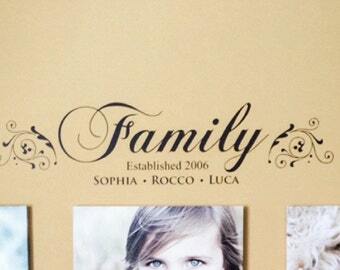 What else is amazing about Luxe Loft's stencils? They come in one piece!! No more spending hours lining up letter by letter. 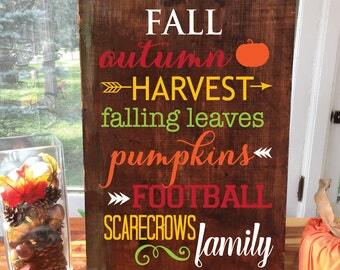 Wooden Signs are popular home decor items, and for good reason - they are incredibly beautiful! 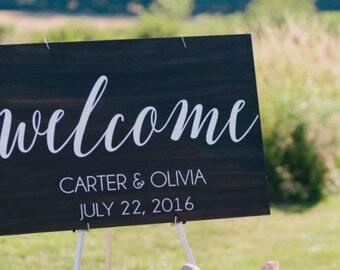 Now is your chance to make signs - your very own DIY wooden sign. 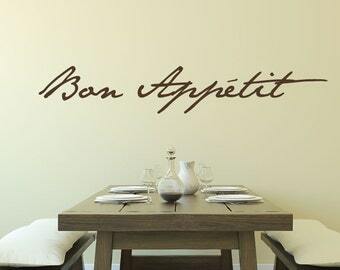 But don't limit yourself to diy signs - you can use our custom stencils for wall painting or stencils for furniture too. Order one of our custom stencils in your desired size and make the perfect stencils for signs or wall stencils for painting. These also make great spray paint stencils. You will get to work one on one with our designer - your very own Stencil Creator - who is an expert in graphic design. Best of all, the process is so EASY. Just choose a custom stencil size from the drop down menu and add to cart. 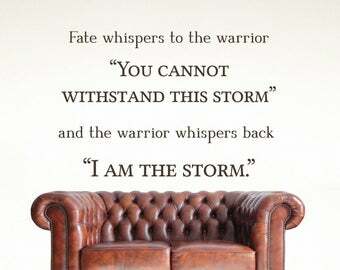 Tell us your quote in the 'note to seller' in your Cart as well as a font name from Dafont.com or general font style. You can also email your vector file. We do the rest of the work for you! SEE DETAILED PURCHASE INSTRUCTIONS BELOW. 2. Add the item to your cart. -Specify if you'd like it horizontal or vertical (if applicable). -If you'd like text, go to www.dafont.com and choose one or two free fonts that you'd like the decal to be in. Make sure the fonts are not too thin or too detailed, or we may not be able to cut it in that font. -Let us know which words you'd like accented (bigger) if any, and any other specifications you need fulfilled to make your stencil perfect. 5. Once I receive all these details, I will create a proof of your stencil for you to approve. A proof is sent within 1-3 business days. 7. Once you approve, we will cut and ship your stencil. 1. You don't have the exact size listed that I want. What size should I order? -Sizes are rough approximations and need not be exact to place an order. If you need exact specifications that aren't listed, just let us know. Then, purchase the listing that is closest to that size. 2. I don't know what size to order. What should I do? We recommend measuring the space the stencil will go in. Choose a size that will make the impact you want - small for a small impact, large for a large impact. We can work with just about any size, so choose the size you think is closest to what you want and we will work with exact specifications during the design process. 3. Can you work with something I designed or a logo I have? Yes! As long as you have a vector file - an EPS, SVG or AI file we can make a stencil from it. In some instances we can work from a flat, one color high resolution JPEG file but please contact us first if all you have is a JPEG. When you check out, just let us know you have a file to send, and send it to our email address that is provided to you when you purchase the decal. 4. Can you make Disney decals or Sports Team stencils? No. We will not infringe on anyone's copyrights. 5. Why should I buy from you instead of the other sellers? So many reasons! :) We are a family based USA business, so you are directly supporting our family when you purchase from us. We design all our decals and don't use clip art. We work hard to make sure you're happy. We are also proud to have been featured in Family Circle Magazine, Glamour Magazine's Blog, the Elvis Duran Morning Show and have decorated the tables of Breastcancer.org's Rock the Ribbon Event. 6. What if I don't like what you design for me? We allow up to 3 revisions. Extra revisions are a bit extra, but don't fret! Most customers are happy with the very first design, and we make sure we tweak it until it is PERFECT for you. We won't make you buy a stencil that you hate! 7. When it comes to quotes, what quotes can you legally reproduce? We cannot create decals from copyrighted material such as books or lyrics. If it is something an author or celebrity, etc. said, we can make stencils from that though. We can also make stencils from songs, books or poems that are now in the public domain (usually 100 years after an author's death). 8. Is there anything you are not capable of making for me? We like to call ourselves graphic design and decal genies, so we can make practically anything! All vinyl is high quality matte vinyl. It is very easy to apply and remove. Let me know if you have any questions. I'll be happy to help you! My custom stencil came out great, I'm really pleased! Love this shop! They did an amazing job on my stencil for this height board! The stencil stuck to the wax paper material the adhesive was on better than it did to what I was stenciling. I had to pull the stencil so hard it some spots it stretched it out.